This is one of my world-famous emails, originally sent Friday 5 April, 2019. Get on the list here. By ‘it,’ I mean Tyche’s Fallen, the latest Ezeroc Wars trilogy. Tiffany’s given me back edits for the first book, and should be done with the second two by, uh… soon. Until we get that hot sauce onto your burger (…is that a good metaphor? ), there’s more to talk about. A social experiment I’m running, where you’re the subject. There was a time when I mentioned how the return to honest work was going pretty well. While I’ve been keeping up with my workday wording habit, I’m in the throes of editing Tyche’s Crusade (third in the abovementioned Fallen trilogy). It’s … rough, even by my own first-draft standards. I’ve found people carrying weapons they never picked up, or entering rooms when they’re on an entirely different planet. Which made me think about how focus drives quality. Uninterrupted flow lets you get better things done, whether it’s words on a page or something else. I guess this isn’t a huge surprise, but it’s made me wonder how I can keep my quality consistent while in the throes of a day job. Hit me back with your tricks and tips on doing 37 different things at once. Do you use lists? Yoga? I’d love to hear your thoughts. I had a quick five to sit down with AKD, and she was kind enough to answer three questions for me, by which I mean you. She and I share quite a few fans, which isn’t too surprising as our space operas share cover concepts like starships and swords. Q: Do you find it tricky to keep story worlds separate? Cadicle vs. Dark Stars – the themes of space opera are intact, but one’s an epic galactic fiesta, and the other is aliens and why they should die, horribly. Tell me a little about writing between these two. A: There were some unique challenges to write Dark Stars after living and breathing the Cadicle universe for so long. Where I had to catch myself the most was regarding my characters’ level of knowledge. In Cadicle, most of the main characters are not only at the center of the action, but they also have a high level of influence; they’re in charge and driving the strategy. In Dark Stars, conversely, while the characters have a good deal of autonomy, they aren’t trained leaders. For this reason, Dark Stars was told from a first person point-of-view, since I wanted readers to experience what it was like for Elle to be thrown into a massively important role while she essentially has no clue what’s going on and what to do next. Though writing in first person was a big change from the multi-perspective vantage of Cadicle, in some ways it was easier. The Cadicle books were written in “close third-person”, so any given scene was through the filter of that character’s perception and knowledge. At least with Dark Stars, I only had to keep track of what one person knew rather than half a dozen perspective characters in a given book! Readers familiar with my work will recognize common themes between both of the series. In both, the world-building includes metaphysical discussions, such as consciousness and superhuman abilities. I enjoyed being able to spin those concepts in a different way in Dark Stars. Q: Every parent has a favorite kid. Of your tales (including the stories in anthologies), which is your favorite? A: Oh. goodness, you’re making me choose??? I’d say that “Scions of Change”, the seventh and concluding volume in my original Cadicle series, is my standout favorite, if I had to pick. The book was the culmination of nearly two decades of envisioning the story universe. It was also the first time I could say “I wrote a whole book series!”, which is a very special thing in an author’s career. My runner-up book would be “Master of Fate”, the third in the Dark Stars Trilogy. I’m especially proud of how that series blended fantasy and science, and that book is the one that brings it all together. Q: I saw your blog post about completing the Cadicle series. What’s next for AKD? A: I’ll be getting back to the Cadicle universe later this year, but up first is a co-authored series with M. D. Cooper in his Aeon 14 universe. It’s sort of a spinoff of a spinoff to his core series, but it will be readable as a complete standalone. The politics in the Serentiy System are a mess, and someone needs to set thing right :-). I also have some standalones planned in the near-ish future. It’ll be a busy rest of 2019! If you’re new to AKD, I’d recommend checking out her latest boxed set. 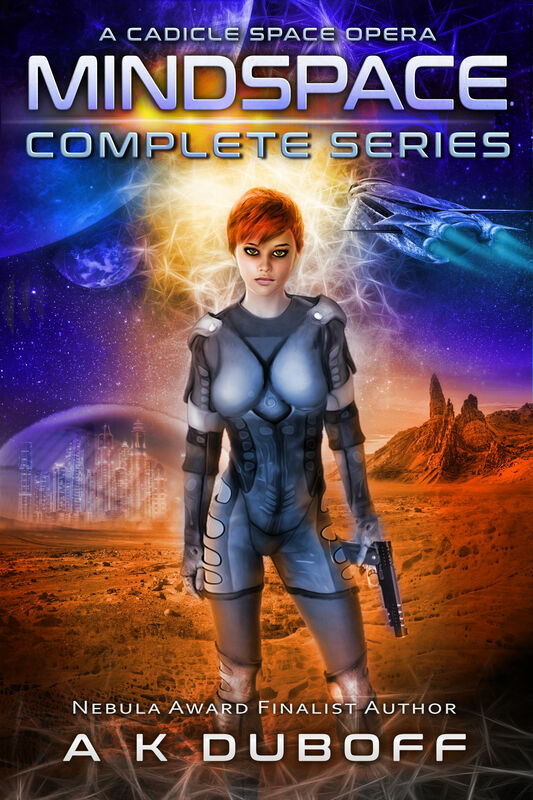 The Mindspace – Complete Series is discounted for a week (and in KU); it’s well worth your time. If you like galactic empire, military sci-fi, or intruige, this will rock your socks. I’ve been pondering the best way to give fans discounts on books within a series. Every author under the sun does deals on their first-in-series, but what about book 2, or hell, even book 27? The basic idea is a 0.99 first-in-series deal for the month, alongside one of the next books in the series. People with the patience of Job can get an entire series for a bargain this way (although this approach could take a while). I’m also sprinkling a few BookSprout ARC links there; if you commit to leaving a review, there are free things. That’s it this week. I hope you dig Amy’s boxed set, and/or find solace in a Tyche book on sale. Until next time, keep your sword sharp but your smile sharper. ← Previous Previous post: Is Writing Everyday Really Necessary?